Organic. Quality salt.Organic sea salt & seaweed grinding mill refill pack A blend of the sea, to bring out the flavour in your cooking. Champ Serves 4 Cook and mash 900g potatoes. Meanwhile chop a bunch of spring onions, including the green tops and put intoa pan with 300ml milk. Bring to the boil and simmer for 2 minutes. Leave to infuse for 30 minutes and stir into the mashed potato. 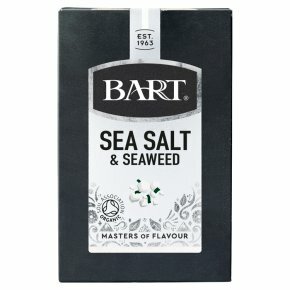 Season with Bart Sea Salt & Seaweed and serve in individual bowls with a little melted butter. Grind a little more sea salt & seaweed to taste before serving.